1.54 inch IPS HD Touchscreen Display Fitness Wristband for Men Women Kids, It's a nice gifts for mother, father and family numbers to care about their health situration.It Can Help You Get a Better Understanding of Your Fitness Level for Better Exercise. Step 1.Download APP by Scan the User Manual QR code instruction. Step 2.Open your phone Bluetooth, keep Bracelet close to the phone to start and enter into APP, then Fine"Mine", and click "Connect a bracelet" to pair with your phone. Just 1 second quick connect! Step 3.Finish pairing, you can unlock more features. 3.Reminder function: Call, SMS, Facebook, WhatsApp, Twitter, Skype, line reminder, QQ, WeChat (content and name of the screen). 5.Other: Do not disturb the mode, lift the screen, set time format: 12H/24H, Alarm clock Setting etc. 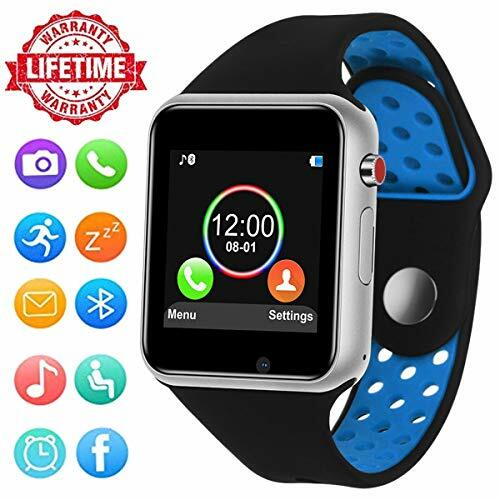 ☻【Multi-Function Bluetooth Smart Watch 】:Dial via watch SIM or Bluetooth optional, Pedometer, Calories Calculation, Sedentary remind, Sleep monitoring, Remote photos, Music playing, Alarm clock, Two-way anti lost remind, voice recorder, muti-timezone, muti-language, daylight saving time and notification push including facebook,twitter, email,calls,texts,etc. ☻【Wide compatibility of Bluetooth Smart Watch】: The android smartwatch compatible with all Bluetooth enabled smartphones. All Android Smartphones, Samsung Galaxy: S8, S8 Plus, S7, S7 Edge, S6, S6 Edge, S5, S4, S3, Samsung Note: 5, 4, 3, 2, SONY, HTC, Huawei, Xiaomi, ZTE, Lenovo, OPPO and other Android phones, Partially Compatible with Apple iPhone 7; Apple iPhone 7 Plus; Apple iPhone 6/6s; Apple iPhone 6/6s Plus;, Apple iPhone 5/5S; Apple iPhone 5C; Apple iPhone 4/4s etc. ☻【Long-Lasting Battery Life & Lifetime Warranty】550mAH lithium battery,average using time is 2 days. Apart from this,We provide 90 days guarantee which ensure enjoyment of your smartwatch. If you have any questions about this product by HongTu, contact us by completing and submitting the form below. If you are looking for a specif part number, please include it with your message.